The Tata Sumo Gold is a utility vehicle by Tata Motors which comes in seven diesel variants. The variants are Tata Sumo Gold CX BS III, CX PS BS III, CX BS IV, CX PS BS IV, EX BS III, EX BS IV and GX BS IV. 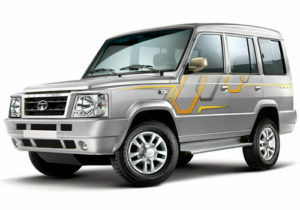 The Tata Sumo comes with a 2,956 cc diesel engine with a five speed manual transmission. In terms of safety, it comes with disc brakes in front with drum brakes at rear, collapsible steering column, side intrusion beam on all doors, engine immobiliser, central locking and keyless entry. Key features include body coloured bumpers, power steering, alloy wheels and music system with USB, AUX and Bluetooth. The ever-masculine looking Sumo Gold underwent a minor facelift which gives it a broad and stable stance and the new body graphics sets it apart The Sumo Gold now stands with an imposing poise that shows off an aggressive front grille that gets a chrome lining where the word ‘Gold’ has been inscribed. The trapeziodal shaped headlamps come integrated with the turn indicators and it’s large size compliments the bold front fascia. It also comes with high powered fog lamps ensuring illumination while driving in the dark. The front bumper, rear view mirror and door handles are all body colored. Being a tall SUV, there are footpegs on the either sides for easier entry and exit for passengers. The rear comes with a new and prominent tail lamp cluster. Also rear fog lamps have been added and a spare wheel has been placed under the body. The wide 215 mm tubeless tyres cover the stylish rims and a high ground clearance of 182 mm completes the overall look of the Sumo Gold, keeping alive its macho appeal. It is not one of those cars which will sweep you away with modern machinery and features to make your life easy but then it won’t make you complain either. Why?Step inside the cabin and it feels really roomy with its large proportions of room. The headroom and legroom is really comforting for the front row passengers. It remains the same for the second row except for the legroom which gets uncomfortable. No one dared to seat on the third row facing benches for long as the knees of the passengers kept hurting and the roll experienced while driving made them throw up.This one gets a new Kenwood music system with Bluetooth. It doesn’t look as impressive but then it functions impressively. It actually pairs phones easily and the same can also be used for Bluetooth telephony with a Mic embedded on the roof. The music system also offers multiple music adjustments which are effective as well. The speaker quality is not the best in the segment but compared to the below average units of the earlier model, this one feels nice. The Sumo Gold comes plonked with a 3.0-litre CR4 diesel engine. This is the same block that also powered the Safari until 2007, however that injection was DiCOR. The CR4 is one of Tata’s recent additions to its technology, enhancing the performance and fuel efficiency of the engine. This engine produces 85bhp of power, compared to the DiCOR that was at 115bhp.The NVH levels are a tad higher than one would have liked. There is some amount of diesel clatter on idling and it’s louder on cold starts. Even the power delivery is linear as the engine produces about sufficient torque throughout the rev range. The gear lever is tall and this makes it difficult to shift, as even the shifts are a bit rubbery. The clutch is light and not tiring with constant usage in the city. All we wish that the vibrations on the gear knob when a bit lesser than what it is currently. The Sumo Gold gets bigger wheels, a tough suspension, and a torquey engine. That gives it a good off-road performance, as long as you don’t sink the rear wheels into mud. Because being a rear wheel drive vehicle, the Sumo Gold can’t do anything if the wheels that are being powered get stuck. Being an UV, and a good one at that, the main purpose of the vehicle is to travel on and sometimes off road, which the Sumo Gold does well. Its on-road manners are acceptable, and so are its abilities in tackling bad road conditions. The soft suspension and high profile 15-inch wheels adorn the vehicle with a comfortable ride. But it still suffers from body roll and is better off when not driven aggressively around corners. – Door ajar warning – Seat belt warning – Front and rear fog lamps – Side intrusion beams for all the doors – Rear high mount stop lamps. The absence of ABS and EBD in the SUV is felt and also there are no airbags for the occupants at the front or the rear. Tata Motors should have at least provided the airbags for the safety of the passengers. The Sumo Gold is placed in a market segment that has never seen much of glamour. It’s either the MPVs and compact SUVs, midsize sedans or the full blown SUVs that are generally more glorified, and portrayed as the desirable vehicles. Blame it on the positioning but UVs aren’t seen as the most luxurious vehicles. They have a purpose and that’s to ferry people, above everything else.Amidst all that, the Sumo Gold tries to make its presence in the market. So, if your commute requires traveling on bad roads, and you need ample space inside the vehicle, the Sumo Gold is a good option. The top-spec GX is recommended.